This is Down On The Street Bonus Edition, where we check out interesting street-parked cars located in places other than the Island That Rust Forgot. Today we're going to check out a couple of cars that live in the oil-mad city of Maracaibo, Venezuela, courtesy of loyal reader Ferli. Make the jump to see the whole gallery and read Ferli's account of his family's vintage machines. I´m from venezuela, actually living in caracas (the capital) but i´m born in maracaibo city, the center of all the oil-business activity in the country. recently i travelled to my hometown to visit my parents, and decided to take some photos of the former cars of my family kept there: A Jeep Wagoneer from aprox. 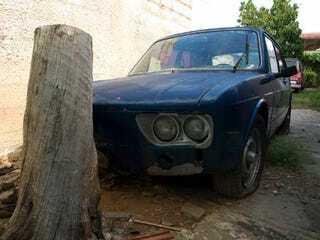 1970 (cannot determine the exact date) and a Volkswagen Brasilia from 1978-79. The Wagoneer was bought from some american guy who brought them here when he came to Venezuela to work in the oil industry... ( at least that´s what my parents told me) the engine is the AMC 360 V8, with a 2-barrel carburetor, an hydramatic turbo 400 and she originally had the quadra-trac AWD system, but was retired because some pieces of the central differential has been damaged and was impossible to find replacements... Still, the Wagoneer runs fine and is used ocasionally to go to the market and stuff like that. The Brasilia is a model of VW designed in Brazil in the Mid-Seventies with the same platform of the Variant 1600. she was used originally by my father and later was the first car of my older brother, later he bought a Pontiac Sunfire and the Brasilia was stopped in the yard, and is not used anymore... some sort of PCH if you want to restore the body panels, haha... well, in jalopnik my username is ferli , and the location of this two cars is in Maracaibo, Venezuela.